An episodic tremor and slow slip (ETS) event is an episode over a discreet period of time of short bursts of seismic energy called tremor plus slow slip on the fault. The slip is so slow that it cannot be felt by humans and does not record the characteristic signature of an earthquake on a seismometer. Sensitive borehole strainmeters and a dense grouping of GPS stations can record these events. One of the first places in the world where ETS was recognized was along the Cascadia Subduction Zone (CSZ). The CSZ is where the oceanic Juan de Fuca plate is diving down beneath the North American plate in the Pacific Northwest. Researchers with the Geological Survey of Canada observed ETS with their geodetic network on Vancouver Island, British Columbia (Dragert et al., 2001). Additional observations captured with the Pacific Northwest Geodetic Array (PANGA) by researchers from Central Washington University show that Cascadia ETS events occur repeatedly (Miller et al., 2002). Today, many ETS events have been observed on the CSZ and the events have a known period of recurrence. The events recur about every 10 months beneath northern California, about every 24 months beneath northwestern Oregon and about every 14 months beneath western Washington and Vancouver Island, British Columbia. Episodes of tremor and/or slow slip are now known to occur along several other subduction zones around the world, including Japan, New Zealand, and Costa Rica. A typical ETS event on the CSZ releases the equivalent energy of a moment magnitude 6.7 earthquake. This is a lot of energy for such a quiet episode, so measuring these events is critical for keeping track of how much the plate boundary fault is moving over time. Geoscientists are actively investigating the role that ETS events play in releasing the strain accumulated across plate boundaries and their ability to inhibit or enhance the likelihood of a great subduction zone earthquake. More information about plate boundary motion will help with future forecasts of the probability for a large earthquake, allowing communities to prepare for such events and any tsunami that might accompany them. 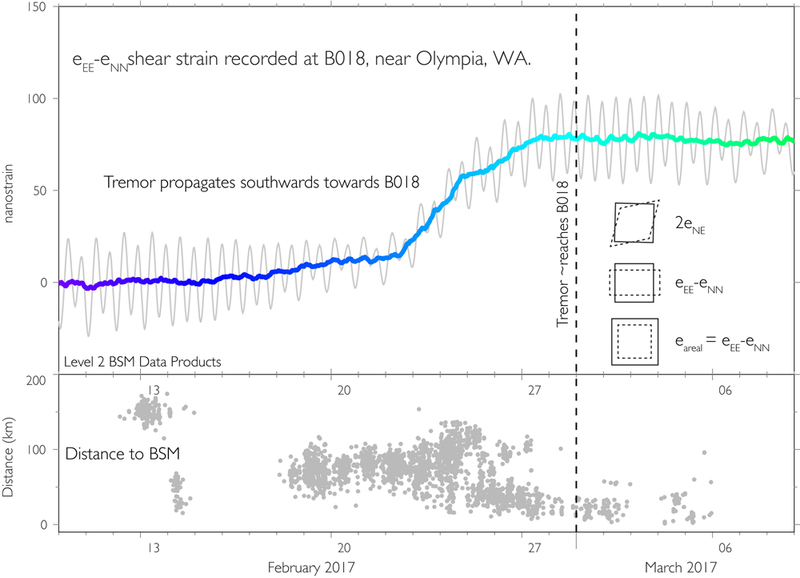 On 21 February 2017, a new ETS event started beneath the Strait of Juan De Fuca, within its typical recurrence interval of 14 months. The ETS was observed with sensitive borehole strainmeters and GPS stations that are part of the Plate Boundary Observatory (PBO) in the United States. Additional seismic and geodetic observations were captured by PANGA, the Pacific Northwest Seismic Network (PNSN), and the Geological Survey of Canada. These observations provide researchers with exquisite details of the plate boundary behavior during such events. Between 21 February and 2 March, the tremor migrated south towards Olympia, Washington. 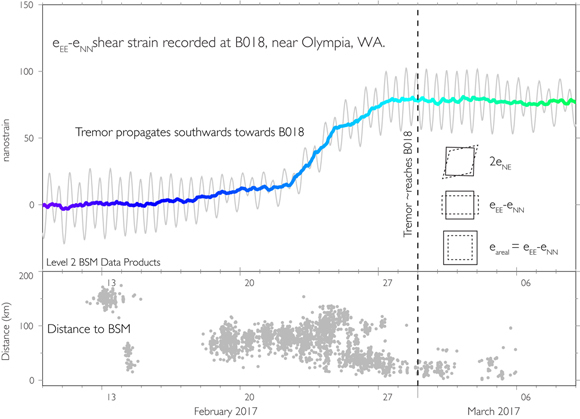 Tremor then seemed to cease, but resumed about two weeks later with a burst of activity under the northern Olympic Peninsula. 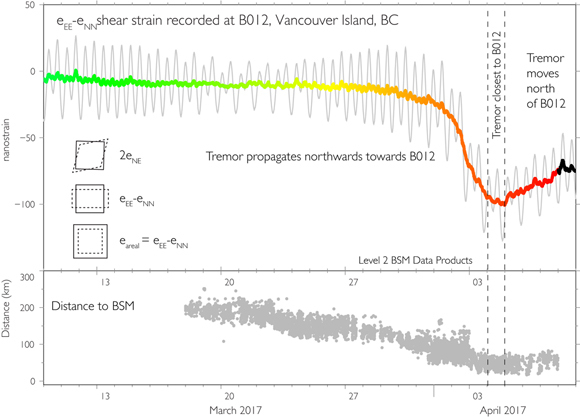 Over the next two weeks the tremor zone migrated northwest under the Strait of Juan De Fuca towards Vancouver Island, ending on 6 April 2017 beneath central Vancouver Island. 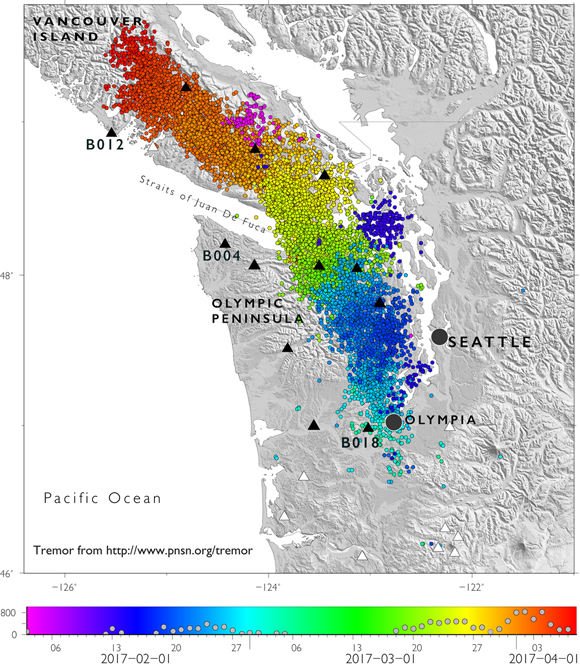 The map view shows the progression of the tremor as recorded by the PNSN. During this ETS event a magnitude 4.2 earthquake occurred near Belfair, Washington that was felt by thousands of people. It is not clear whether this earthquake is related to the ETS event. Many PBO strainmeters in boreholes about 100 meters deep have recorded the slow slip, for example B012 on Vancouver Island, British Columbia and B018, near Olympia, Washington. The strainmeters detect minute twisting and stretching of their boreholes as two or five centimeters of fault slip occurs 40 to 60 kilometers below them. ETS events in Cascadia have happened repeatedly for decades and during those observed to date, slow slip has been much deeper on the subduction zone fault than the offshore zone expected to generate the next great Cascadia earthquake. Therefore, geoscientists think that any elevated probability of a great earthquake during an ETS event is extremely small. Nevertheless, it is important to watch for possible changes in the patterns of Cascadia ETS events. Despite the low rate of background seismicity in Cascadia, ETS events remind us that Cascadia is an active subduction zone where it is always necessary to be prepared for damaging earthquakes. References: A Silent Slip Event on the Deeper Cascadia Subduction Interface, Herb Dragert, Kelin Wang, Thomas S. James, (2001) Science, 1525-1528. Periodic Slow Earthquakes from the Cascadia Subduction Zone, M. M. Miller, T. Melbourne, D. J. Johnson, W. Q. Sumner (2002) Science, 295, 2423. Acknowledgement: UNAVCO wishes to acknowledge the help and advice from Evelyn Roeloffs, USGS, who has expertise in earthquakes, ETS and strainmeters.